Dubai : Prime Minister Narendra Modi on Sunday witnessed via video-conferencing the foundation stone laying ceremony of a temple in the UAE while attending a community event here. According to Indian External Affairs Ministry spokesperson Raveesh Kumar, Modi witnessed laying of the foundation stone for the Bochasanwasi Shri Akshar Purushottam Swaminarayan Sanstha (BAPS) temple on the Abu Dhabi-Dubai highway. "The first Hindu temple in Abu Dhabi being built on a generous gift of land by the Crown Prince of Abu Dhabi reflects UAE's commitment to tolerance and harmony," Kumar tweeted as Modi, along with a large number of people from the Indian community watched the event from the Dubai Opera House. The first Hindu temple in Abu Dhabi will come up on 55,000 square metres of land, according to India's Ambassador to the United Arab Emirates (UAE) Navdeep Suri. The temple's construction will be completed by 2020, and open to people of all religious backgrounds. It will be the first traditional Hindu stone temple in the Middle East, said a spokesperson from the BAPS that is entrusted with the design, construction and management of the temple. The temple will be hand-carved by Indian temple artisans and assembled in the UAE, said the BAPS spokesperson. The UAE has two Hindu temples which are located in Dubai. Devotees from Abu Dhabi and other emirates have to drive to Dubai for prayers and offerings. The temple compound will include a visitors' centre, prayer halls, exhibition centre, learning areas, sports area for children and youths, thematic gardens, water features, a food court, a books and gift shop and other facilities. The UAE is home to around 3.3 million expatriate Indians. 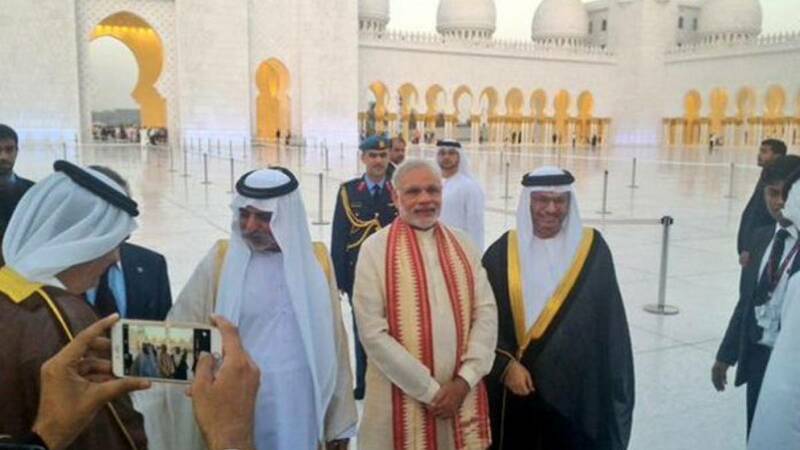 Earlier in the day, Modi paid tributes at the UAE war memorial Wahat Al Karama near Abu Dhabi. After visiting Palestine earlier on Saturday, Modi arrived in Abu Dhabi later in the evening on the second leg of his three-nation tour of West Asia and the Gulf. Following delegation-level talks between Modi and Crown Prince of Abu Dhabi and Deputy Commander of the UAE Armed Forces Sheikh Mohammed Bin Zayed Al Nahyan, India and the UAE signed five agreements on Saturday, including a historic one on energy cooperation that awarded a consortium of Indian oil companies led by ONGC Videsh a 10 per cent interest in Abu Dhabi's offshore Lower Zakum concession. This is Modi's second visit to the UAE after his visit in 2015. Later on Sunday, the Prime Minister will deliver the keynote address of the Sixth World Government Summit, in which India is the guest of honour country this year. After completing his engagements in Dubai, Modi will leave for Oman on the third and final leg of his tour.